Google Apps and Linkedin are two of the most important platforms in the world today. You and your business should absolutely be leveraging both heavily. 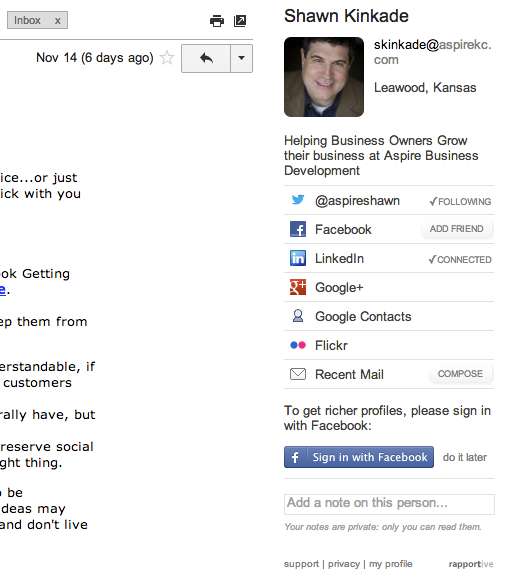 Let's look at my view of the Linkedin profile of Shawn Kinkade from Aspire Business Development. We can see contextual information provided by Gmail and Google Calendar. We can also see Linkedin's features of adding Notes, Reminders, Tags and additional information. Since I've connected Google Apps and Linkedin, I can see some great contextual information. This information can be especially helpful for people you don't talk to or meet with very often. We can see snippets of Gmail messages as well as Google Calendar event information. While not dependent on connecting the accounts, Linkedin also offers the ability to create Notes, add Reminders, and even Tag (aka Label) contacts accordingly. Very cool! How do you connect the accounts? It's actually really easy. From your Linkedin Home page, select Network and then Contacts. Go to Settings in Contacts, select Sync for Gmail, Calendar and Contacts. You may see them as one selection or individually as Gmail, Google Contacts and Google Calendar. Select the Google Account and "Allow Access" to create the connection. Combining Google and Linkedin takes two great services and makes them even more useful. On the Gmail side, we also recommend Linkedin's Rapportive which will run on modern browsers Chrome, Firefox or Safari. Rapportive will bring Linkedin's contextual information right into Gmail! Rapportive is a must have extension for Chrome, Firefox and Safari. It brings Linkedin information into Gmail. Linkedin is one of the world's most popular Cloud Computing services. Linkedin was founded in 2003 by Reid Hoffman, a former Apple and PayPal executive. The Linkedin service is quickly become a full CRM application. It will be exciting to see what they roll out in 2014.